In the wake of the Wells Fargo (WFC) scandal, in which the bank’s employees created up to 2 million accounts without permission, it’s hard to find any winners. Certainly not the inconvenienced customers who had to deal with canceling accounts they never authorized. Not regulators like the Consumer Financial Protection Bureau, whose very existence was questioned yet again when it didn’t find out about the fraud until long after it began. And not former-CEO John Stumpf, whose retirement was announced Wednesday evening. At first glance, the bank itself might even appear to be the winner. Wells Fargo paid a $185 million fine that roughly amounts to a rounding error given its revenue of $86 billion. Moreover, Wells Fargo clawed back $60 million from executives in the wake of the scandal. Still, the bank is battered, with its relationship to customers in tatters and the possibility of more sanctions for its executives. Perhaps as Patrick Swayze mused in “Roadhouse,” nobody wins a fight. But in revisiting how the saga unfolded, it’s clear one victor did emerge: Senator Elizabeth Warren, who used a power relatively new to Congress to —virality. Soon after the bank agreed to cough up $185 million, the Senate Banking Committee called Wells Fargo CEO John Stumpf into the chamber to answer its questions. Quickly, it turned into a brutal grilling as Warren and others berated Stumpf for failing to stop the problem. As Warren demanded to know whether he had or planned to pay back his CEO-grade compensation or resign, Stumpf sheepishly deferred that decision to the board he sits on and chairs. As my colleague Rick Newman pointed out, Warren and the committee didn’t have authority to administer any real punishment, which made Warren look like an ineffectual grandstander at first. The federal government does not and never has run Wells Fargo and does not have the power to claw back compensation or fire an employee; that power rests with the board. But in that hearing, Warren wasn’t playing checkers. The former Harvard law professor was playing Kasparov-grade chess. 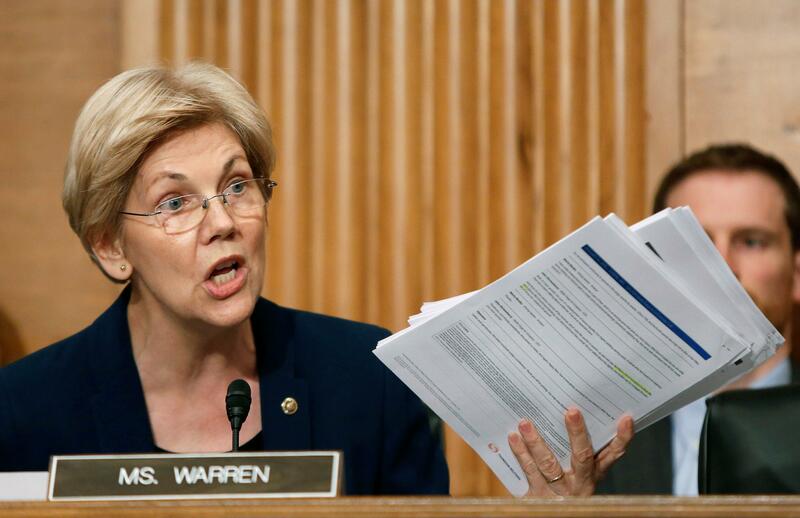 From the moment Warren began her 18-minute tirade, the wires began to buzz, and the testimony made a rare flow off C-Span 2 to the internet and social media. Putting on one heck of a show, Warren channeled the betrayed public, flagellating Stumpf for the bank’s misdeeds under his leadership. The people know their champion when they see one, and in short order a Facebook video posted by Warren just after the public shaming racked up more than 11 million views and almost 200,000 shares. (Warren’s office declined to comment for this story or on their video-heavy Facebook page.) AlterNet posted it and netted over 7 million, and multiple other news organizations including the BBC, NBC, NowThis, Huffington Post had their own Facebook clips of Warren’s grilling, racking up well over a million views each. And this is just one platform. Exactly a week later, Wells Fargo said it would claw back $60 million from Stumpf and head of community banking Carrie Tolstedt, who led the community banking division that violated its customers’ trust. Although Warren did not herself use legislation or official congressional power to get Wells Fargo to claw back $60 million from executives, her public shaming and the Facebook post that followed fanned the public opinion fires so vigorously that the bank’s board had to do something to quell shareholders and an angry public. Warren’s flagellation may have connected more acutely with people’s feelings more than other news coverage of the fraud, satisfying a public who couldn’t call up the CEO to vent themselves. Plus, they even got to see a big guy sweat. Warren’s viral speech goes far beyond Stumpf. Her performance in Congress was tantamount to another, far greater fine. Before her speech, the bank could have come out relatively unscathed, since the offenses didn’t severely damage most of the customers involved. But when Warren turned up the volume, it became a public relations disaster. In the days after the hearing, people dumped Wells Fargo in the midst of a soaring market, driving the price down to 3.6%. A Credit Suisse analyst mused “what we don’t know is where this ends,” and cut 2017 earning per share $0.15—which, in absolute terms, is $772.5 million in earnings. Deutsche Bank revised similarly, cutting its earnings estimates for 2017 by $1 billion, adding that “this could have a longer term effect on valuation.” As the Charlotte Observer noted, this is the largest decline of any of the big six banks. Clearly a public shaming will not work in every situation, especially in the private sector, as “pharma bro” Martin Shkreli showed the world when, in a congressional hearing, he invoked his Fifth Amendment rights. Not everyone has a board and shareholders to answer to. But for the right company, in the right situation, and—most importantly—with a lawmaker up to the rhetorical challenge, it’s another tool to keep corporations honest. Ethan Wolff-Mann is a writer at Yahoo Finance focusing on consumerism, tech, and personal finance. Follow him on Twitter @ewolffmann. Where is the $60 million Wells Fargo clawed back from its executives going?